Great review Popo, thanks! Ultima is a series that I always feel like I'm 2-5 games out before finally diving into. I'm not sure the whole emphasis on virtues & morality is something that really excites me as a gamer though, and that seems like a major theme throughout the whole series. Just out of curiosity, what sort of time investment is typically required from this era of Ultima games (IV - VI)? So the first three Ultima games are just straight up murder things RPGs. In that in the first game you need to murder a jester and escape guards in order to progress the plot. So go in, grind some, do a couple of events, beat game. Ultima 1 and 2 are pretty short if you know what you're doing, but Ultima 2 can take a while if you try to do it completely blind, as there is a ton of content that doesn't actually do anything for you (and that's assuming you have the community patch, otherwise that content is actually jacked up and they don't even give you the unnecessary hints). Ultima 3 is longer because it takes a lot longer to grind to the appropriate levels and gold you need to beat it. Ultima IV is the one that introduces the virtue system, and that's the one where you have to really pay attention to it. Ultima V and VI go back to a Bioware style morality meter; it goes up when you expect and goes down when you expect and it generally means that you can short cut a few quests because you have enough karma built up to take the hit. But in IV it's pretty integrated into things, and you have to do a lot of activities you wouldn't necessarily think of if you are in video game mode. In terms of time commitment, I'd say IV is somewhere between 20 and 40 hours, whereas V is 10-20 and VI is 15-20. Some of that time save comes from not having to grind virtue and some comes from being able to utilize a lot of knowledge from IV in the later games. If you skip IV and go to V or VI then those games add in several hours as you orient yourself and pick up information you learn in IV. Hey Popo, how long do Ultima IV, V, and VI compare to III in terms of length? I've only beaten I and II, but since the series operates in sets of trilogies, I figure I could hop around to either IV or VII without an issue. VII has always intrigued me, even if I'm not a big fan of the camera angle, and I admit I've always been curious to see just how bad IX really is. Very good info, and thanks for including info on the early titles as well. I really like starting game series at the beginning in order to understand their progression over time. Those first three games sound like a good way to dip my toes into some Ultima! I may just have to check out Ultima I relatively soon. I mean ... who doesn't like murdering jesters? The Goonies is a game that I have been meaning to play for a long time, primarily due to a question I always had regarding its sequel The Goonies II. 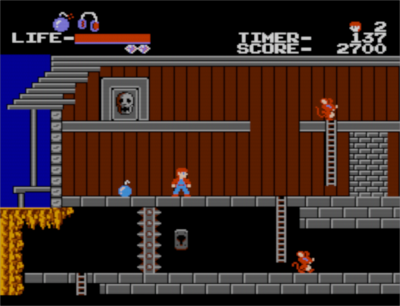 As a kid I was never entirely certain whether The Goonies II on NES was intended to be a cross-platform direct sequel to the movie itself, or whether there was in fact a Goonies (I) game that I had somehow missed. It wasn't until years later that I discovered that the latter was true, and years after that that I finally got around to playing the darned thing; 2018 in fact. This month's Together Retro theme provided the perfect opportunity to finally check out The Goonies. 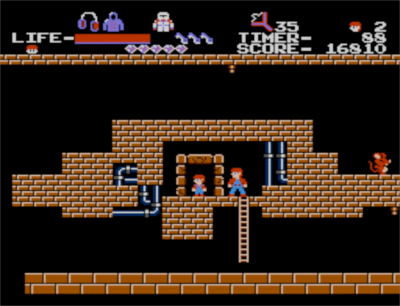 So the Goonies was only ever released in Japan, though it was released on a few different platforms, and had its origins on Nintendo's Vs. / PlayChoice 10 arcade systems. In this capacity it shares its 'origin story' with several early NES releases (i.e. the NES black box games), and in many ways this is a game that would have fit in very well with other early NES releases. The small amount of in game text is entirely in English, so I can only assume that perhaps regional licensing issues prevented this game from being released outside of Japan. 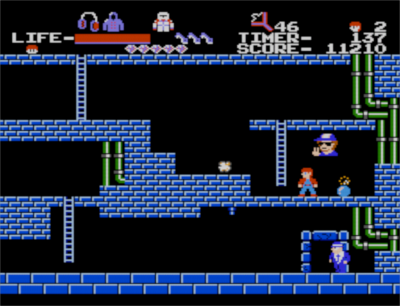 The graphics style, the music, and the tight responsive gameplay are all elements that this game shares with other early NES games. 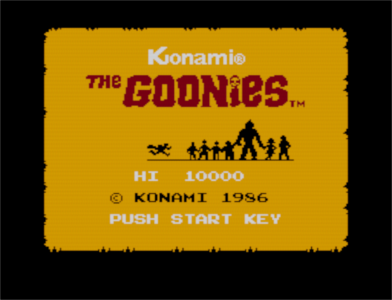 In this capacity it's a bit of a shame that The Goonies never saw a wider release as I really feel like it could have been an NES hidden gem. That's not to say that everything is just peachy with The Goonies though. It implements a particularly draconian time limit that I suspect is an artifact of its origins as a Nintendo Vs. game (these were arcade cabinets in which each token bought you 'playtime' rather than a 'full game' per se). The trouble is that this aggressive time limit is at odds with the exploratory nature of the game. It's a game that both encourages exploration and punishes you for it at the same time. Rote memorization of level layouts is key to success here, but this definitely robs the game of some of its fun. Furthering this point is that all power up items in the game are invisible, requiring you to plant bombs in specific locations in order to discover. Even this wouldn't be terrible save for the fact that you can only carry one bomb at a time and you must also use bombs in order to attain the required pickups for progressing to the next level. On one hand I understand that this was a means of extending playtime (it's not a particularly lengthy game once you have locations and the like figured out), but on the other hand I feel like the game could have been so much better if only for some slightly relaxed time limits. 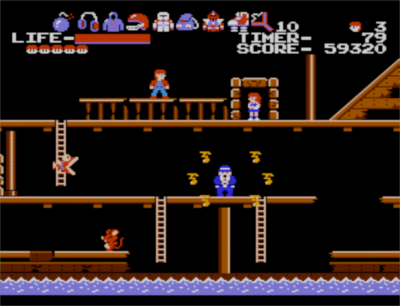 Still I very much enjoyed my time with The Goonies and I would highly recommend it to any fans of early NES black box releases, particularly so if you also enjoyed The Goonies II on NES. Last edited by nullPointer on Thu Jan 11, 2018 3:33 pm, edited 1 time in total. Great post, null. 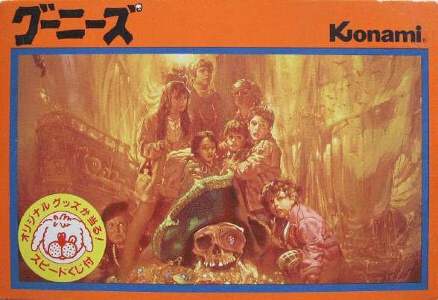 I have a copy of The Goonies II, but I've been holding off as I want to play part one on Famicom first. I'll make it a priority. Shigeru Miyamoto: the man is essentially synonymous with "early Nintendo." He is, after all, the individual responsible for all Famicom launch titles, not to mention the Mario and Zelda juggernauts that would follow. While most of the master's games are well-known (to put it lightly) classics, there is one oddball entry that never reached the shores of North America. Titled Devil World, it was deemed too controversial for sensitive Westerners due to the fact that it's knee-deep in religious symbolism. 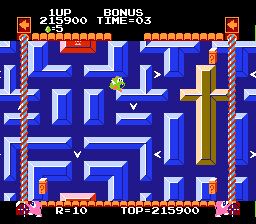 Each level is adorned with crucifixes including a giant one center stage, and the primary antagonist is Literally Satan who is also joined by a merry bunch of demons. 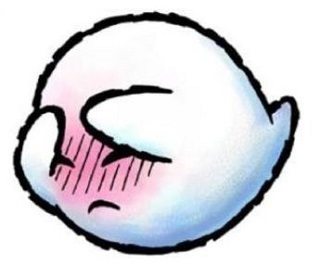 To this day, the game has still not received an official release stateside, via the Virtual Console or other means. It did, however, end up in on the NES in godless Europe back in '87. So, is this some long-buried hidden gem that every retro gaming fanatic should rush to import? Well, no. It isn't. It is an interesting game, I'll give it that much. Devil World's unorthodox (heh) structure is immediately apparent. There are three different (and alternating) styles of play; essentially every round is broken up into a trio of "sub-rounds." And the explicit goal for our hero, some proto-Yoshi creature named Tamagon, varies based on whatever sub-round he finds himself in. First, there are the dot-nomming sections (cue the Pac-Man comparisons). Here Tamagon is tasked with eating(?) all dots within a maze. Malicious demons give chase but can be vanquished by blowing fire in their faces. Such a feat is only possible if Tamagon is first in possession of a crucifix. These are numerous, though the granted effect is temporary. Strangely, the crucifixes never vanish from the board, they're merely icons that Tamagon walks over, so there's always an ample supply of firepower available. After the dot-nomming comes, what else, Bible-collecting. In these stages Tamagon must head to each of the four corners of the maze, grab the Bibles, and return them to the center. Bibles can also be used for offensive purposes, obviously. Lastly comes the bonus rounds. Here Tamagon runs around consuming eggs. One lucky egg grants a one-up but most contain the ever-useless prize of "more points." These are the only segments of the game that have a time limit. Think it's possible to grab every egg? No. It isn't. Complicating everything in Tamagon's (under)world is the addition of The Wall. Yeah, The Wall. The Devil is placed at the top of the screen barking orders at a couple of minions who continually move a large square border in one of the four cardinal directions. 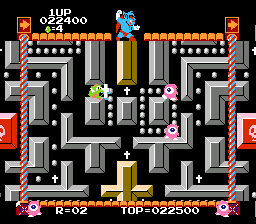 Thus, Devil World is continuously scrolling and Tamagon can get caught (and killed) between the moving wall and a rigid segment of maze. The Devil is always pointing in the direction the border moves. No wait, he's pointing in the opposite direction. Ever-helpful, that Satan. It's a mechanic that could have conceivably added some sense of urgency to the game, but it instead just slows everything down. Oftentimes there's nothing to do as the wall boundaries can temporarily place dots and Bibles outside of Tamagon's reach. In one specific Bible-collecting area I desperately needed the stage to scroll right or left, as Tamagon was holding the final Bible and needed access to the Bible depository. But Satan thought it would be humorous to instead have the screen scroll upwards. Four times. Additionally, everything else in the game is comparably glacial. Tamagon moves like he's wearing lead boots and so do the foes that "chase" him. Most deaths are caused by the distraction that's birthed from boredom, not from being caught by a wily adversary. The game does look legitimately cool. It's not 80% blackness, which is a nice change of pace from most ancient Famicom titles. 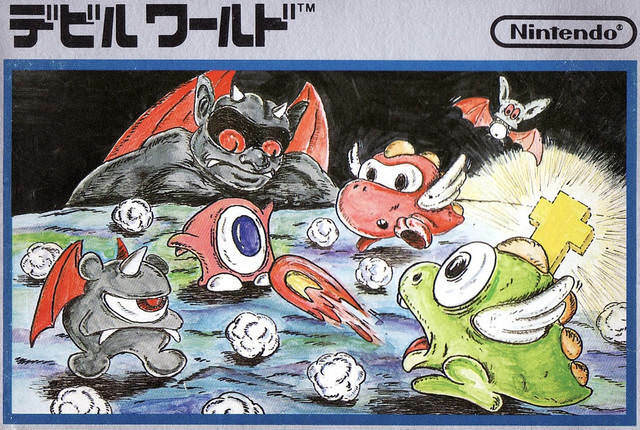 The enemy sprites are adorable, and The Devil himself looks more goofy than scary. 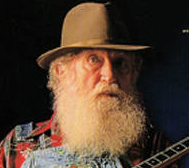 There's a light-hearted jovial theme throughout, though mid-80s Middle America would have perhaps thought differently. There are no superfluous "A and B" types of "modes" present, though there is some decent two-player co-op should one wish to speed things up a wee bit. I can't recall a single lick of music, unfortunately. Devil World is really more of a fascinating historical oddity than a "good game." Worth checking out should one wish to explore the early Famicom scene; just don't expect an obscure treasure. Oh, and don't bother with the PAL release. It's incredibly pricey, and like many old carts the Japanese original is in English. Last edited by BoneSnapDeez on Thu Jan 11, 2018 3:50 pm, edited 6 times in total. Ack wrote: Hey Popo, how long do Ultima IV, V, and VI compare to III in terms of length? I've only beaten I and II, but since the series operates in sets of trilogies, I figure I could hop around to either IV or VII without an issue. VII has always intrigued me, even if I'm not a big fan of the camera angle, and I admit I've always been curious to see just how bad IX really is. I'll be honest, with Ultima III I demonstrated that I could keep murdering townsfolk without consequence and then used a save editor to cut out that grinding time and just skipping to the end. So I don't have a super good handle on Ultima III's length. Once you've done the grinding it's another few hours to beat. Ultima IV you have to get max level in order to get every companion (which is required to go through the final dungeon if I recall correctly), so it definitely takes the longest; even the speedrun is twice as long as Ultima V and VI. 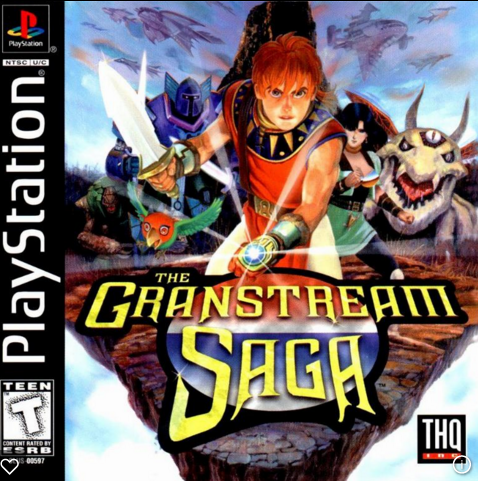 I beat The Granstream Saga on the Sony Playstation 1 this afternoon! I bought this game less than a year ago because it was made by Quintet, a wonderful developer from the SNES era that made games like ActRaiser and Illusion of Gaia. I had it on my radar, but my process was sped up because of the untimely passing of Backloggery member, CherryTonic. She had the game unfinished and since she could no longer beat the game, I volunteered to beat it in her place. It had been a while since her passing and I wanted to make sure the project kept moving and I wanted to be able to participate. So, I was greatly pleased to see it a part of my New Year Cookie Marathon and decided to make it my first beat of 2018. The Granstream Saga is a very...interesting game. The best parts are the anime cutscenes and the music. The cutscenes are extremely well done and look exactly like late 90's Anime. The characters look wonderful in them and I love the look of them. The music is absolutely superb with some standout tracks that stuck in my head while playing the game. The combat is very unique as it reminds me of a pre-cursor to a game like Dark Souls. Every combat, you go into this overhead battle area and the two of you face off with each other. Every strike is very deliberate, so the enemy and yourself can counter attack rather easily. Distance and position of each strike is very important, so it reminds me a lot of fencing. The story is also very interesting to a certain point. The story and game direction go off the rails several times. You repeat many of the same places and do many of the same tasks over and over again. It gets incredibly repetitive, especially by the end of the game. However, the story is worst for it. Since the battles are so short and the dungeons are rather small, 80% of your game is reading text boxes. I was into it for a while, but it just kept going and they kept talking that I just wanted them to shut up. The fights are interesting, but serve no real purpose. You gain experience through the story and you only get items and useless gold. I had way too many items by the end, so I just started avoiding attacks especially considering many of the fights are incredibly mean. Even though The Granstream Saga is flawed, I didn't think it was too terrible. It was interesting and the combat was a very unique take on the genre. If you are interested in a different and unique ARPG, it is worth a shot! It's a pretty good time, especially if you liked the cartoon (there's almost an episode's worth of cutscenes included). I'd say this game is more rewarding on hard mode, as long as you stick with the good alternate weapons, since it's overall better balanced and makes you care more about experience points and hidden power ups. Still I prefer the SNES game. 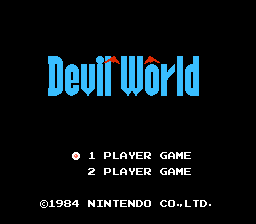 Devil World is actually the only famicom game I own. I’m hoping to change that when I take my trip to Tokyo in the next couple years. I ended up buying it with a Famiclone at a retro game store in Michigan. The console was cheap so I figured why not and asked the clerk what Famicom game he’d recommend. I think he must have just known the history of that one because I can’t imagine recommending it if you’ve played it, except as you stated, as a curiosity. It’s hard and not in a fun way, due to that screen scrolling. 5) Fists elimination tower(steam): A vertical scrolling platformer, your goal is to climb a tower, the tower has 150 floors and you have 5 seconds per floor( although some levels have time extension items). The game is presented as a smash tv style over the top game show. You have a hostess who makes commentary as you progress, when you die you respawn as a new contestant, there is no gameplay difference in the contestants but it is fun to see all the different character models. Really tight controls and very quick pick up and play gameplay make this a very fun, but short romp. 6) 222 Hearts (steam): a platformer where the gimmick is dashing. You can dash a few times in air and as you dash through hearts your dash meter is refilled. Tons of spikes and instant deaths everywhere, the concept of the game was great and the level design is solid, but the awkward controls made this game far more frustrating than fun. King of fighters 94(neo geo) this game made me remember how terrible and cheap SNK AI is, Hopefully I remember to never play this game again unless I have a friend over. 9) 88 heroes (steam): A platformer game where there is 88 levels, each with an 88 second time limit, and 88 different playable heroes. When you die you respawn as a random different hero, when a hero dies he is permanently dead. The game looked amazing but is one of the most disappointing games I have ever played. Most of the heroes are worthless, the game has a grainy visual style with much of the screen obstructed. The gimmick of the game is the main villain is watching your progress on a monitor, so much of the screen is obstructed by him and his screen, making the actual playable screen too small. Terrible game and should be avoided like the plague. 10) Iron Commando (steam/snes) Hands down, the worst beat em up I have ever played. Words cannot describe how terrible this game is, I would urge everyone on here to emulate it (please don't buy this garbage) just to see how low the bar for snes beat em ups could go. I challenge the entire racketboy community to find a worse 16 bit beat em up.